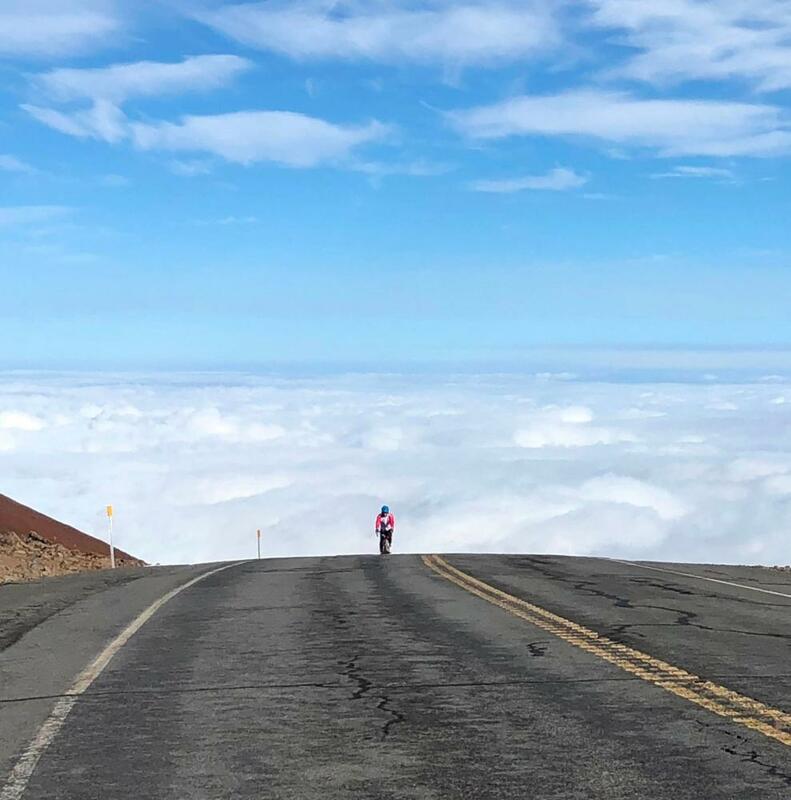 Cycling and climbing by bike the top climbs in the United States including the Top 10 which we have thoroughly documented #1 Mauna Kea, HI (#1 World/#1 US), #2 Haleakala, HI, #3 Mt. Washington Auto Road, NH, #4 Pikes Peak, CO, #5 Onion Valley Road, CA, #6 Horseshoe Meadows Road, CA, #7 Mauna Loa, HI (longest bike climb in the world), #8 Waipoli Road, HI, #9 White Mountain, CA and #10 Kaloko Drive, HI. This page contains the top bike climbs in the United States, including those in Washington, Oregon, California, Nevada, Arizona, Utah, Colorado, Montana, Wyoming, Idaho, Vermont, New York, New Hampshire, Tennessee, etc. Cycling, riding and climbing the top, most difficult, hardest, challenging, extreme, best, scenic, inspiring, bucket list climbs in the US. These climbs can be viewed via the map below (scroll in to view climbs in particular areas), or by a detailed list of the climbs that can be arranged by difficulty, distance (longest climbs in the area), altitude gained, highest elevation (highest summit), average grade (sort the grades by varying distances), lowest start point, etc. You can also view the Top 10, Top 25, Top 50 and Top 100 bike climbs in the United States. Click on "Climb Page" button at the bottom right corner the photos above to jump to the detail page for that particular bike climb. Scroll down to the summary at the bottom of this page for more details. Zoom/Pan map to discover additional climbs. Climbing hills and mountains in the United States is certainly different from cycling in places like France and Italy where there is such a long history of cycling. All of the Grand Tours (Tour de France, Giro d'Italia and Vuelta a España) are in Europe. However, the US does boast one Elite Stage Race in the Tour of California (held every year since 2006, as of 2019) which attracts top tier cyclists and cycling teams. There are some unbelievably challenging as well as scenic bike climbs in the United States. US cycling climbs are much more spread out than in Europe, although there are several climbing areas in the US which boast a high concentration of HC and world class climbs by bike that are in close enough proximity to ride them from a central hub. There are also two Top World Climb Area in the US: Owens Valley (11 HC in a 50 mile radius) and Hawaii (Big Island + Maui; #1 Hardest World Bike Climb + #1 Longest World Bike Climb). The top bike climbing states are California (45 Top US 100 / 3 Top World 100 Bike Climbs), Colorado (10 Top US 100 / 1 Top World 100), Utah (10 Top US 100 / 1 Top World 100) and Hawaii (7 Top 100 US / 5 Top World 100). In our opinion, the greatest bike climbing race (this is subjective of course) is the annual Mt. Washington Auto Road Bicycle Hillclimb. The Bob Cook Memorial Bicycle Race (Mt. Evans, CO) Pikes Peak Cycling Hill Climb (Colorado Springs, CO) and the Cycle to the Sun (Haleakala, Maui, HI) are not far behind Mt. Washington in challenge. Mt. Washington Auto Road Bicycle Hillclimb is held the third Saturday in August. Noteworthy former champions: Tyler Hamilton, Tom Danielson, Phil Gaimon. The following are our picks for The Top US 100 Bike Climbs by category. Only two are objective (hardest [FIETS formula] and longest). For the subjective categories, we appreciate that if you ask 10 cyclists their top pick for, say, the most beautiful climb, you will get 10 different answers. That is the reason most of our website is based on the FIETS formula to rank climbs. Using a formula at least takes the subjectivity out of the ranking process, although we do acknowledge that there is always debate about the actual merit and accuracy of the formula one selects to rank bike climbs. The hardest bike climb in the United States is Mauna Kea, Big Island, Hawaii -- by far the most difficult bike climb in the world. Mauna Kea has it all: length (42.5 miles), altitude (sea level to nearly 14,000’), and gradient (the last 10 miles are from 8,120’ to 13,779’ at 10.7% average grade). Just across “the saddle” from Mauna Kea is the great shield volcano Mauna Loa. Beginning from the opposite side of the island from the start of Mauna Kea (coming from Hilo is shorter, but steeper) in Waikoloa we climb 62.2 miles at 3.4% average grade gaining 11,848’ from near sea level to 11,848’. Mauna Loa Observatory Road (the last 17 miles at 5% to 10,989’). The most popular bike climb in the US, in our experience, is Mt. Lemmon in Tucson, Arizona. Popular because of the fantastic winter (not summer, although it is always cooler 7,000’ up the mountain than at the bottom of the climb) saguaro cactus at the start and amazing hoodoos at the midway point. If we use the traditional and common definition of epic to equate to “legendary” or “monumental”, you would be hard pressed to ignore Pikes Peak. This is mountain is well known, if not famous. It is host to The Pikes Peak International Hill Climb (aka Race to the Clouds), every year since 1916, the Pikes Peak Peak Ascent and Marathon (since 1956) and the Pikes Peak Cycling Hill Climb. Pikes Peak leaves nothing off the Most Epic Bike Climb Checklist: difficulty (#4 US/#23 world), elevation (#2 US), distance (#19 US) and varied scenery -- forests, lakes, hairpins and unobstructed views of surrounding mountains and the Colorado Plains 8,000’ below. Set of six giant hairpins at miles 19-20 (12,180’-12,700’) at 9.5%. We defer to the late CBS news correspondent Charles Kuralt (“On the Road with Charles Kuralt”) for this category. Kuralt referred to Montana’s Beartooth Highway (and pass) near Yellowstone National Park as "the most beautiful drive in America.” Travelling the country for 25 years in a motorhome (going through six times in all) reporting on roads, beautiful scenery and landscape, and winning a Peabody Award for his efforts, Charles Kuralt seems to be a trusted and reliable source for this US bike climb category. 30 miles (6th longest US), gaining 5,745’ to elevation 10,905’ at 3.3% average grade. On this one, you could ask a group of adventurous cyclists what US bicycle climb has the most breathtaking views along the way and you’d probably not get any duplicate answers. In our experience and opinion, the Glacier Point bike climb from Yosemite Valley to Glacier Point offered the most stunning views of any we have experienced in the US, and thus warrants discussion for greatest views on a bike climb in the world, for that matter. Our vote here goes to the anonymous yet spectacular Whitaker Forest bike climb in California’s Sequoia National Forest. Ride through pristine redwood groves on a remote and seemingly private dirt National Forest Road (easily done on a road bike), through a ride-through giant sequoia, then onto General’s Highway and a short distance past the finish is the largest tree by volume in the world, known as the General Sherman. Nearly all serious cyclists have heard of Alpe d’Huez (although not all know how to pronounce it 😕) and its famous 21 hairpins. Well, the US has its Alpe d’Huez in Palomar Mountain, San Diego California. We count 18 hairpins on Palomar, but some report 21 . . .
. . . hmmm . . . coincidence? Bear Camp bike climb is “out there.” This is a very remote and isolated climb. We made the mistake of riding this one alone in sketchy weather, and it was a bit spooky. But, it IS and adventure, that’s for sure. Surprisingly, Mt. Hamilton, Santa Clara County, California, has been featured most often (six times from 2006 to 2019) in the Tour of California, the United States only Elite Professional Stage Race. Mt. Baldy / Glendora Mountain Roads are a close second, having been featured five times. Lick Observatory at the summit of Mt. Hamilton. If someone put a gun to our head and demanded we choose just one favorite out of all the exceptional bike rides in the United States, we would probably have to choose The Road to Hana. That being said, there are so many other amazing and diverse options in these vast United States we call home. 44 miles, gain 4,625’ from Paia to Hana.